Tintin is a young Belgian reporter who becomes involved in dangerous cases in which he takes heroic action to save the day. Almost every adventure features Tintin hard at work in his investigative journalism, but seldom is he seen actually turning in a story. He is a young man of neutral attitudes and boy scout ideals; in this respect, he represents the everyman. Readers and critics have described Tintin as a well-rounded yet open-ended, intelligent and imaginative character, noting that his rather neutral personality—sometimes labelled as bland—permits a balanced reflection of the evil, folly and foolhardiness which surrounds him. His boy-scout ideals, which represent Hergé's own, are never compromised by the character, and his status allows the reader to assume his position within the story, rather than merely following the adventures of a strong protagonist. 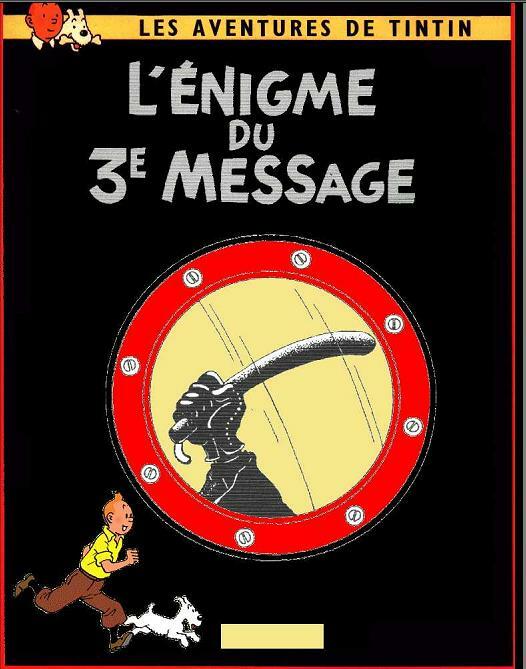 Tintin's iconic representation enhances this aspect, with Scott McCloud noting that it "allows readers to mask themselves in a character and safely enter a sensually stimulating world." Snowy , a white fox terrier, is Tintin's four-legged companion. The bond between Snowy and Tintin is very deep as they have saved each other from perilous situations. Snowy frequently "speaks" to the reader through his thoughts , which are supposedly not heard by the human characters in the story. Snowy has nearly let Tintin down on occasion, particularly when distracted by a bone. Like Captain Haddock, he is fond of Loch Lomond brand Scotch whisky, and his occasional bouts of drinking tend to get him into trouble, as does his arachnophobia. Captain Archibald Haddock, a seafaring captain of disputed ancestry , is Tintin's best friend, who was introduced in The Crab with the Golden Claws. Haddock was initially depicted as a weak and alcoholic character, but later became more respectable. He evolves to become genuinely heroic and even a socialite after he finds a treasure captured by his ancestor, Sir Francis Haddock. The Captain's coarse humanity and sarcasm act as a counterpoint to Tintin's often implausible heroism; he is always quick with a dry comment whenever the boy reporter seems too idealistic. Captain Haddock lives in the luxurious mansion Marlinspike Hall. Haddock uses a range of colourful insults and curses to express his feelings, such as "billions of blue blistering barnacles" (sometimes just "blistering barnacles", "billions of blistering barnacles", or "blue blistering barnacles"), "ten thousand thundering typhoons" (sometimes just "thundering typhoons"), "troglodyte", "bashi-bazouk", "visigoths", "kleptomaniac", "ectoplasm", "sea gherkin", "anacoluthon", "pockmark", "nincompoop", "abominable snowman", "nitwits", "scoundrels", "steam rollers", "parasites", "vegetarians", "floundering oath", "carpet seller","blundering Bazookas", "Popinjay", "bragger", "pinheads", "miserable slugs", "ectomorph", "maniacs", "freshwater swabs", "miserable molecule of mildew", and "Fuzzy Wuzzy", but nothing that is actually considered a swear word. Haddock is a hard drinker, particularly fond of rum and of Loch Lomond scotch whisky; his bouts of drunkenness are often used for comic effect. Captain Haddock remained without a first name until the last completed story, Tintin and the Picaros. 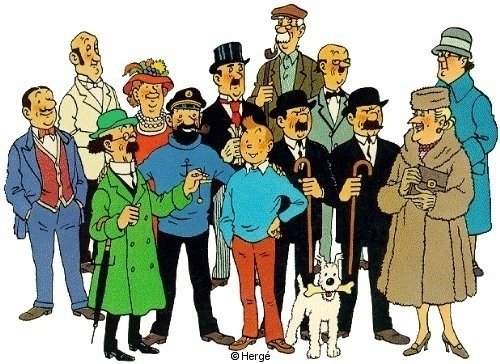 Hergé's supporting characters have been cited as far more developed than the central character, each imbued with a strength of character and depth of personality which has been compared with that of the characters of Charles Dickens. Hergé used the supporting characters to create a realistic world in which to set his protagonists' adventures. To further the realism and continuity, characters would recur throughout the series. It has been speculated that the occupation of Belgium and the restrictions imposed upon Hergé forced him to focus on characterisation to avoid depicting troublesome political situations. The major supporting cast was developed during this period. Professor Calculus, an absent-minded professor and half-deaf physicist, is a minor but regular character alongside Tintin, Snowy, and Captain Haddock. He was introduced in Red Rackham's Treasure, and based partially on "Auguste Piccard", a Swiss physicist. His presence was initially not welcomed by the leading characters, but through his generous nature and his scientific ability he develops a lasting bond with them. Eventually, at the end of the album Land of Black Gold, he has become a resident of Marlinspike Hall. Calculus has a tendency to act in an aggressive manner when someone says he's "acting the goat." He is a fervent believer in dowsing, and carries a pendulum for that purpose. Calculus's deafness is a frequent source of humour, as he repeats back what he thinks he has heard, usually in the most unlikely words possible. He does not admit to being near-deaf and insists he is only a little hard of hearing in one ear. Thomson and Thompson are two bumbling detectives who, although unrelated, look like twins whose only discernible difference is the shape of their moustaches. They provide much of the comic relief throughout the series, being afflicted with chronic spoonerisms and comic pratfalls. They are thoroughly incompetent in their tasks, always bent on arresting the wrong character, but in spite of this they somehow get entrusted with delicate missions. The detectives usually wear bowler hats and carry walking sticks, except when abroad: during those missions they insist on wearing the "costume" of the locality they are visiting so as to blend into the local population, but instead manage to attire themselves in folkloric attire that actually makes them stand apart. The detectives were in part based on "Hergé's" father Alexis and uncle Léon, identical twins who often took walks together wearing matching bowler hats while carrying matching walking sticks. Bianca Castafiore is an opera singer whom Haddock absolutely despises. She seems to constantly be popping up wherever he goes, along with her maid Irma and pianist Igor Wagner. She is comically foolish, whimsical, absent-minded, and talkative, and seems unaware that her voice is shrill and appallingly loud. Her speciality is the Jewel Song ("Ah! je ris de me voir si belle en ce miroir") from "Gounod's" opera, Faust, and sings this at the least provocation, much to Haddock's dismay. She tends to be melodramatic in an exaggerated fashion and is often maternal toward Haddock, of whose dislike she remains ignorant. She often confuses words, especially names, with other words that rhyme with them or of which they remind her; "Haddock" is frequently replaced by malapropisms such as "Paddock", "Harrock", "Padlock", "Hopscotch", "Drydock", "Stopcock", "Maggot", "Bartók", "Hammock", and "Hemlock", while Nestor, Haddock's butler, is confused with "Chestor" and "Hector." Her own name means "white and chaste flower," a meaning to which Professor Calculus refers when he offers a white rose to the singer in The Castafiore Emerald. She was based upon opera divas in general (according to "Hergé's" perception), "Hergé's" Aunt Ninie who was known for her "shrill" singing of opera, and, in the post-war comics, on Maria Callas. Other recurring characters include Nestor the butler, Chang the loyal Chinese boy, Jolyon Wagg the infuriating insurance salesman, General Alcazar the South American leader, Kalish Ezab the Arab emir, Abdullah the emir's mischievous son, Dr. J.W. Müller the evil Nazi German doctor, Oliveira de Figueira the friendly salesman who can sell even the most trivial of items, Cutts the Butcher who is repeatedly telephoned by accident by Haddock and whose phone number is repeatedly confused with Haddock's, Rastapopoulos, the criminal mastermind, and Allan, Rastapopoulos' henchman and formerly Haddock's first mate. The settings within Tintin have also added depth to the strips. Hergé mingles real and fictional lands into his stories, along with a base in Belgium from where the heroes set off . This is best demonstrated in King Ottokar's Sceptre, in which Hergé creates two fictional countries and invites the reader to tour them in text through the insertion of a travel brochure into the storyline. Other fictional lands include San Theodoros, San Paolo, and Nuevo Rico in South America, the kingdom or administrative region of Gaipajama in India, and Khemed on the Arabian Peninsula which replaced the setting of Mandate Palestine used in the first edition of Land of Black Gold. Along with these fictitious locations, actual nations were employed such as Belgium, Switzerland, the United Kingdom, the United States, the Soviet Union, Congo, Peru, India, Egypt, Indonesia, Nepal, Tibet, and China. Other actual locales used were the Sahara Desert, the Atlantic Ocean and the Moon.